Below you will find a list of the various ANH kits (for now, I could look into ESB/ROTJ/etc. if demand is there) available and what hardware/accessories/soft goods are included or available as an option. This list was born out of a recent question PM, so I thought I'd expand it out by adding other armor makers and posting it for all. Hopefully this will help all of you with your shopping/builds, as well as act as a resource for those aiming for EI/Centurion in knowing what to expect in terms of additional purchases that will be needed. *Mic tip mesh is too fine to be screen-accurate. **Does not meet EI/Centurion requirements. ***Correct TD screws available through re-use of (incorrect) ear screws, painted black. 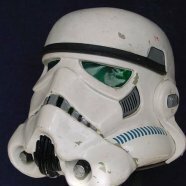 Newer kits/helmets have correct ear screws, TD screws will need to be sourced elsewhere. Note: Hard armor only. Soft goods not included or offered separately. *Brackets and hardware sold as full strapping kit. Note: Hard armor kits only. As this is a new thread and currently a work in progress, if anything is incorrect or out of date, please let me know either in this thread or via PM and I will update it. I don't plan on adding FX or any other armors that are out or production, as this list is meant to focus on kits that can still be purchased. Vendors: to get added to this list, please contact me. If your kits or options change, please let me know. Can anyone with an RS kit confirm whether or not they come with plastic hand guards in addition to/instead of latex if you don't opt for the strapping pack? UNTRIMMED KIT: meaning you have to trim and sand every single part yourself, all parts are premarked for easy trimming. FULLY TRIMMED KIT: all armor and helmet parts come fully trimmed and finished with all holes predrilled ready for assembly, basically the most tedious process of the build is done for you, trimmed helmet assembles in minutes using only 8 nuts and bolts like the originals no glue required. FULLY BUILT Armor/Helmet ready to wear: Professionally built to the highest standards ready for centurion approval out of the box. All armor/helmet parts require full trimming and assembly, we can fully trim just the helmet for you at extra cost. helmet assembles in minutes using only 8 nuts and bolts like the originals no glue required. Armor and Helmet comes fully built ready to wear out of the box to Centurion level approval. *Holster comes with black attachment strips which will need to be replaced for ANH EIB/Centurion. Is this really an EIB/Centurion requirement? Not a big deal to change out, but I thought it was still an either/or sort of thing. Looking at the CRL no, guess I’ve just assumed it was. Will update. I can add whoever, it will make my life easier if you have their contact info, even better if they’re members here, then I can just point them to the thread. I don’t plan on adding old FX or AM kits though, I intended this to be more for stuff you can get right now. AM 2.0 are still readily available. AM 1.0 kits and FX kits are sufficiently old enough and have enough barriers to new approvals that I don’t plan on including them in the list. Have you gotten any more details on WTF armor? AM (2.0) added, working on RWA, WTF and RT. Any other vendor requests please let me know! looking for any leads on ANH Hero kits. TM and WTF both have hero kits, I'd contact them for pricing/etc. Added some stunt/hero clarification, additional contact info, and link to the approved vendor thread. Fixed a couple goofs, WTF and RWA added.